Got all of these lamps for free since the Santa Clara Restore does not sell incandescents anymore and they were all going to the trash (according to one of the employees). Most of the bulbs are GE halogens but there are a few other bulbs mixed in as well. reasons not going go that restore anymore. orolly reasons there not selling is that they are prolly charging too much for them so they sat on shelf not selling as fast as they would like. The Santa Clara Restore is pretty small so that might be why. restore once. Cause Me and silverliner traveled up 99 then back down 101. IIRC About a year ago, Silverliner told me (in a comment on an older post) that he has not been to the Santa Clara Restore yet. 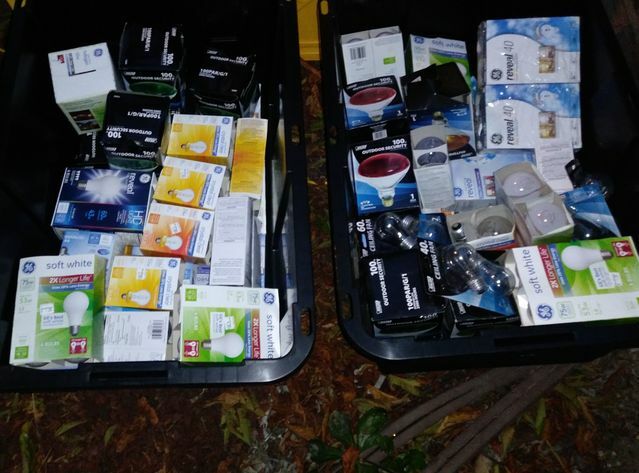 Sep 02, 2018 at 06:36 AM Author: Cole D.
I don't ever see HID bulbs at the restore here. I think it's probably that those types of bulbs don't get donated as often because it's not likely that people have them sitting around. Mostly I see incandescent or CFL bulbs at the one here. I’m so glad you got these, and for free! That makes me so sad that many perfectly good incandescents are going into the trash. I hope I can always continue to find incandescents in ReStores. They still sell incandescents and fluorescents at the ReStores around my area! The ReStores in my area no longer sells incandescent bulbs or fluorescent lights so I don't go to them anymore. This ReStore still sells fluorescent tubes but any F40T12s that pop up usually sell out pretty quickly due to them being more popular in this area than F32T8s (in residential areas, most commercial areas are all F32T8). What wonderful saves, glad you did! The local Restores here still sell incandescent, fluorescent and HID lamps but it seems like they have been getting lesser and lesser of the older stuff now. One near me had a couple of 1kW Sylvania MH lamps when I stopped by last week.